The photo-sharing site Flickr made news earlier this year when it rolled out a whopping 1 TB free storage allowance for all users. Now, just in time for the holidays, they have introduced Flickr Photo Books, a new service that turns those snapshots you've been uploading to the site into a professional-looking, high-quality hardcover book. Flickr tends to cater to photography hobbyists and professionals; especially those with high-resolution, well-composed photographs. Flickr Photo Books are appropriately professional as well. Each of your photos is printed on high-quality lustre paper stock, and each book is protected with a glossy custom-printed dust jacket. To make sure every page looks its best, Flickr provides some basic tools to edit, crop, zoom, and create full-bleed layouts. Each glossy hardcover 11.5” x 8” Flickr Photo Book will set you back $34.95. That covers the cost of printing the first 20 pages. Each additional page will cost an extra $0.50, up to a max of 240 pages. Considering that Flickr can host your pictures at high resolution, the resulting photo book has the potential to look very high quality. 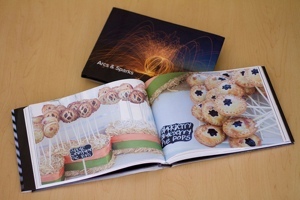 For more on Flickr Photo Books or to get started on creating your own, visit the Flickr website. If you’d like to consider other options as well, check out our picks for the Best Photo Book Sites.